WTI crude prices have hopped back above $54/b this morning. 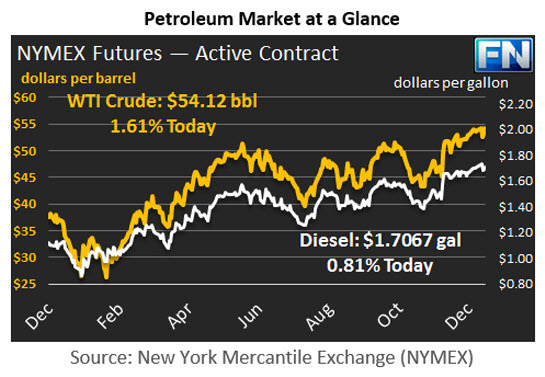 WTI opened at $53.73/b today, an increase of $0.34, or 0.64%, from yesterday’s opening price. During this 4-day holiday week, prices spiked and collapsed on Tuesday, and spent the rest of the week creeping back up. Current prices are $54.12/b, $0.36 above opening. The OPEC production cuts appear to be underway, with some key countries including Oman, Kuwait, and Saudi Arabia reporting cuts. The U.S. Dollar has finally fallen, adding support to crude prices. Some U.S. economic indicators are slightly weaker than desired. The Jobs Report is showing payroll employment rising by 156,000 in December, while economists had anticipated 175,000. The unemployment rate was 4.7%, up from 4.6% in November. This week’s data on inventory movements has been complex, and there have been large variances between three key sources. Schneider Electric’s survey showed a market expectation of a 2.8 mmbbls crude drawdown, a 1.2 mmbbls distillate stock build, and a 1.5 mmbbls gasoline stock build. The API reported a much larger swing in inventories: a 7.4 mmbbls crude stock draw, a 5.2 mmbbls distillate stock build, and a 4.3 mmbbls gasoline stock build. The Schneider survey shows a small net draw of 0.1 mmbbls. The API data, in contrast, shows a net stock build of 2.1 mmbbls. 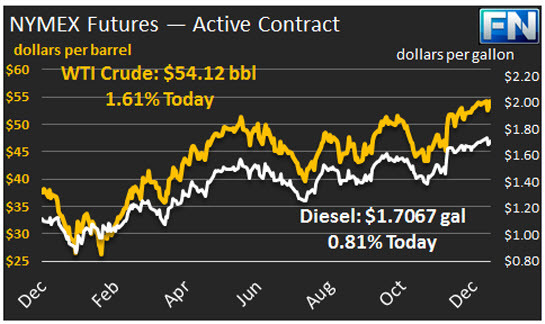 The official EIA data reported a crude stock draw of 7.051 mmbbls, consistent with the API data. But the EIA reported massive increases in gasoline inventories (8.307 mmbbls) and distillate inventories (10.051 mmbbls.) Veteran market analyst Tom Kloza of OPIS noted that data at the start of a New Year are often skewed, however, and this week’s data was further complicated by weather and refiners delaying some crude import volumes because of year-end tax implications. Distillate opened at $1.704/gallon in today’s session. This was 0.58 cents above yesterday’s opening price. Current prices are $1.7067/gallon, up by 1.12 cents from closing. Prices surged in early trading and have subsided since then. RBOB opened at $1.6391/gallon today, down around a tenth of a cent from yesterday’s opening. Prices have come back to $1.6489/gallon today, 1.12 cents above the opening price.